Auction Halted Of Banksy Mural Removed In London : The Two-Way The U.S.-based auction house that was due to sell the work on Saturday, announced that the item was withdrawn from sale. The artwork was expected to fetch between $500,000 and $700,000. A man inspects a plastic cover placed over an artwork attributed to Banksy in London. 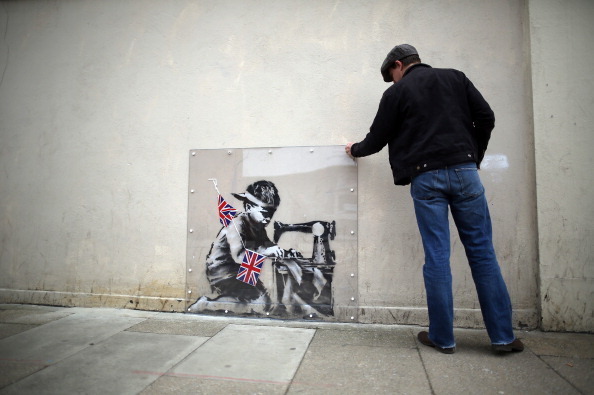 The stencilled image depicts a poor child making Union Jack flags on a sewing machine and is located on the wall of a Poundland discount shop in the Wood Green area of north London. Last week we told you about the uproar surrounding the auction of a piece of art by mysterious graffiti artist Banksy that disappeared from its home on a wall in north London. The Associated Press is now reporting that Fine Art Auctions Miami, the U.S.-based auction house that was due to sell the work on Saturday, announced that the item was withdrawn from sale. The artwork was expected to fetch between $500,000 and $700,000. "The controversy began earlier this month, when residents of a north London borough noticed that a piece of art by mysterious graffiti artist Banksy had disappeared. "It looked like the part of the wall that housed the stenciled work depicting a boy sewing Union Jacks had been sliced, the work removed and the wall repaired with fresh plaster." Residents of Haringey borough, the area from which the mural disappeared, were furious. In an open letter to the auction house, the borough's council noted, "For you to allow it to be sold for huge profit in this way would be morally wrong, and completely contrary to the spirit in which we believe it was given to our community." But on Sunday, the mood was decidedly more optimistic. One of the councilors behind the campaign to retrieve the artwork told the Haringey Independent that campaigners were "halfway there" to getting the piece returned. "Banksy, if you are not familiar, is a shadowy figure in the art world. He doesn't give interviewsand has gone from being a "guerrilla street artist" to a celebrated one worth millions. There is tension in those two things: On the one hand, he's a rebel, a critic of both the traditional art world and the government, but on the other hand, his street art is fetching hundreds of thousands of dollars and threatening to erode his street cred."